According to the Vision Council’s 2016 UV (Ultraviolet Radiation) Protection report, parents are more likely to wear sunglasses (56%) than their children (only 29%!). Yet children, who spend much more time outside, are typically exposed to three times the amount of sunlight and UV radiation that adults get. This early exposure can lead to serious eye damage and complications later in life. Particularly when it comes to children under 10 years of age, a child’s eye is more vulnerable than an adult’s. This is because, in children, the human lens lets about 70% more UV into the eye than in an adult. Further, once the cells of the lens are damaged they cannot repair themselves so the damage continues to accumulate throughout life. While immediate danger may be minimal, early efforts toward eye protection can prevent problems in adulthood. At 20 years of age, the average person has received 80% of their life’s UV exposure. Children spend more time outdoors playing, participating in sports and even during recess at school. Since children have more transparent lenses in their eyes and more sensitive skin on their bodies, they are at great risk of experiencing adverse effects of overexposure to UV light. The effects of overexposure to UV light at a younger age may not show up until later in life, with higher risk of cataracts and age related macular degeneration. This is why it is critical to effectively protect our eyes from the sun. UV exposure doesn’t just come from the sun. Sunlight reflected off of water, snow, sand and even pavement increases UV exposure and therefore wearing a wide-brimmed hat is often not enough to protect the eyes. Additionally, children are often looking upwards directly toward the sun at adults and objects that are taller than they are. The immediate effects of sun damage, such as sunburns to the eye, often go unnoticed, especially by children. Therefore, unlike a serious and painful sunburn to the skin which can serve as a learned deterrent, the risks and results of eye damage are less obvious. Children need to be taught about the importance of wearing sunglasses. This starts with a good example set by parents who should wear sunglasses every time they go outside. Purchasing a good pair of properly protective sunglasses that are comfortable and fit your child, and encouraging their use and care are also essential. UV protection is available in some clear lenses as well as sunglasses. The choice can be confusing if you do not have some background information. Not all lenses are equal in terms of UV protection. For example cheaply made UV400 sunglasses have a spray-on coating that can wear off with cleaning and give you a false sense of security. Also lens distortion and poor frame quality of discount sunwear may cause eyestrain. Ophthalmic quality lenses that provide UV protection and crisp optics should be made to last with good warranties to back up problems that can occur. 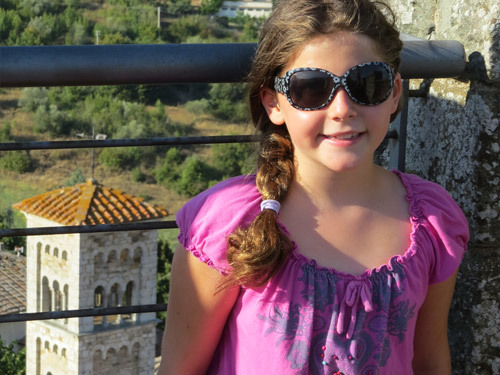 There is a plethora of options for children’s sunglasses and a good pair doesn’t need to break the bank. The first and most important criterion is that the lenses block 100% of UVA and UVB rays. You may want to also consider impact resistant polycarbonate lenses for more durability. For smaller children, look for adjustable sunglasses or a pair that includes a strap to keep the glasses in place. Inviting your child to shop with you will help ensure that the glasses are comfortable, fit right and that the child will like them, which can definitely increase the likelihood of the child agreeing to wear them as needed.